Jennifer Hudson's circuitous route to success is further proof that actually winning "American Idol" is hardly a necessity. Sometimes talent wills out. So it's a little odd that the Oscar-winning "Dreamgirl" has chosen the "please all the people" blueprint for her long-in-coming solo debut instead of taking the play-to-your-strengths Daughtry route. But never mind that "Jennifer Hudson," out today, is a sometimes illogical jumble that hopscotches from gritty urban soul to glossy adult contemporary pop to the song that clinched her the little gold statue - "And I'm Telling You I'm Not Going." Hudson ties it all together with her titanic vocal prowess and emotional conviction. The Chicago native owns the strong material and elevates the weak. And if she can't save a dreadful duet with T-Pain, then blame the king of Auto-Tune, not the divine Miss H.
The most striking thing about the record, and what ultimately holds it together, is the placement of Hudson's voice front and center in the mix. Harvey Mason Jr., who oversaw all of the vocal production, deserves much of the credit for this. Instead of forcing the singer's big tones to battle with the various production flourishes of the marquee collaborators, Mason's pristine approach keeps the focus where it belongs. So listeners can enjoy the jittery cymbals of the meditative Ne-Yo/Stargate contribution, "Can't Stop the Rain," or the dramatic timpani rolls of Polow Da Don's "My Heart" without getting distracted by them. The album's quirkiest number is also its most compelling. As Timbaland rolls out a crazy quilt of fuzzy synths, doo-wop vocals, and beatboxing, Hudson, sounding like some nutty young version of Aunt Esther from "Sanford and Son," keeps threatening potential suitors with a whack from her "Pocketbook." Add in a silly, raunchy rap from Ludacris and you've got the zaniest hip-hop soul song in recent memory. Unfortunately, Hudson also got the memo that all contemporary R&B albums must end with a spiral into a quagmire of slow jams. Hudson's snoozy seven aren't terrible; they're just not remarkable. They include the obligatory Diane Warren ballad about being saved by love ("You Pulled Me Through") and a Sunday number for her church lady fans, "Jesus Promised Me a Home Over There." A no-hard-feelings duet ("I'm His Only Woman") with Fantasia, the eventual victor of Hudson's "Idol" season, is a hoot, but the melody meanders more than a Paula Abdul critique. The reprise of "And I'm Telling" still induces tingles, and the shiny "Invisible" boasts a nice tune but can't mitigate the overall soporific effect of the second half. Despite its flaws, Hudson's debut comes on much like her "Dreamgirls" character, with admirable self-assurance and real-girl sensuality. Every song may not be a winner here, but the woman who sings them sure is. 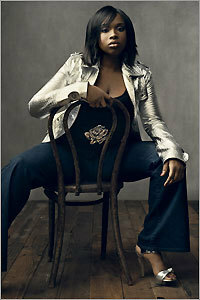 (Arista Records) "Dreamgirl" Jennifer Hudson released her self-titled debut CD on Sept. 30. The latest reviews and features.